The Walking Bostonian: Is Houston more progressive than Boston in transportation? 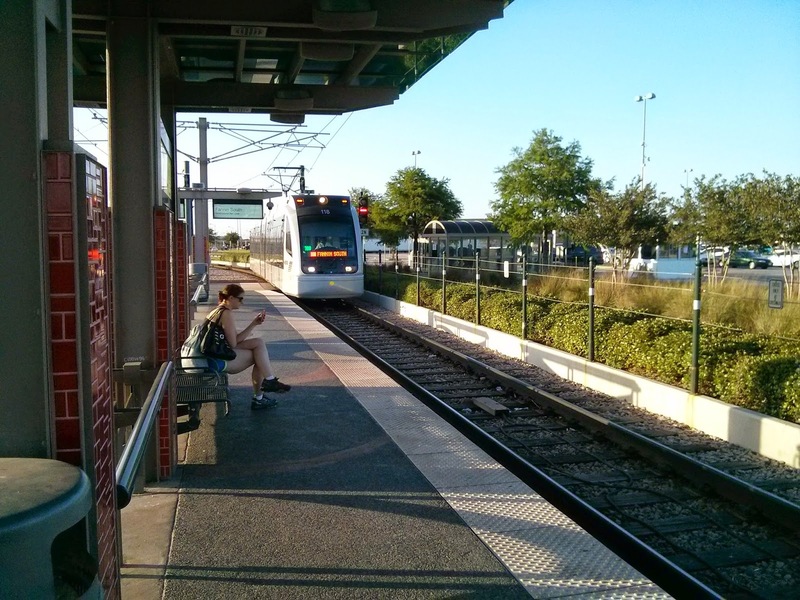 Is Houston more progressive than Boston in transportation? Okay, gotcha: not really, it's still very much a land of sprawl and crazy-large highways. But I read this article last month and then had a chance to see some of it for myself. In fact, Houston's core neighborhoods grew around a 90-mile streetcar system, and the city has a higher WalkScore than Austin. "Houston is amazingly more progressive and more concerned about things like quality of life, walkable neighborhoods, and bike infrastructure than people realize," says Susan Rogers, a professor of architecture at the University of Houston. After visiting, I have to concur, although they do seem to have a long way to go yet. I had to drive myself more in those two days than I did in the last two years combined (or more). I want to talk about one technical area in which Houston is doing significantly better than Boston: at-grade transit. METRO's light rail line is just over ten years old so it does not have the venerability of Boston's Green Line. It does, however, have a lot of details implemented correctly, and it shows. I was able to ride it one evening, to get dinner downtown, and I made some observations along the way. Signal priority or outright preemption at every single intersection it crosses. As the train approaches, lights flash, traffic signals change, and a sign lights up telling drivers to get out of the way of the train. In some cases, they use railroad crossing arms, in other cases, just ordinary traffic signals. Proof of Payment ticketing with modern, touchless fare card technology. I got a "Day Pass" and boarding was as simple as waving my card at a box on the platform, then hopping onboard using any door I wanted. Dwell times were consistently low, approximately 20 seconds per stop before we started moving again. Accessibility is great. Decent station spacing. Actually, average spacing is about 1/2 mile, which is a bit far, but there is some significant variability in that. The denser areas have shorter station gaps. At least one infill station is planned, Central Station, to assist with the upcoming expansion projects. A transit mall downtown, where private vehicular traffic was limited or excluded. The train had clearly been prioritized over the automobile in terms of space. Automatic cap on fare paid per day: with the "Day Pass" I pay $1.25 for the first trip, $1.25 for the second trip, $0.50 for the third trip, and nothing for all remaining trips of the day. The MBTA's Day Pass is $11.00, almost thoroughly useless, unless you are sure that you are taking more than 5 trips that day. Houston did not feel the "need" to put an awful fence down the middle of the entire right-of-way, which is a big difference from the way Boston's transportation agencies treat us ordinary folks on foot. Boston's Green Line "B" plods along at about 8-9 mph on average, unreliably. The "C" branch goes 8-11 mph depending on time of day. The "D" branch, almost fully grade separated, manages to average 15-18 mph. The "E" branch does 9-12 mph, on the schedule. The SL5 "bus rapid transit" goes 8-10 mph as scheduled, and is slower in reality. The NYC subway system averages 17.4 mph overall. Through sheer operational competence, Houston has managed to create a surface transit line, crossing many intersections at-grade, that is time and reliability-competitive with expensive grade-separated subways. Very impressive. This is an accomplishment of which the city should be very proud. And it doesn't end there. Apparently, the original line was constructed for about $325 million in 2003 (including purchase of trains). That's about $50 million / mile in today's dollars. It has achieved approximately 36,000 rides per day, making it the 2nd busiest per-mile in the country. And at $9,000/daily boarding, it's a bargain in human terms. So while Houston will never match Boston as a city in my view (although I wish them the best), I think we could really stand to learn quite a bit from METRO. Houston is supposedly the home of highway-centric thinking, and yet, they have a gem of a light rail line that could be held up as a model for the entire country. It's good transit in a red state, done cost effectively and operationally efficiently. METRO went up against what must have been an extremely strong motorist lobby... and won. Meanwhile, here in Boston, where we are supposedly so public transit friendly, we can't even get our city to support signal priority, all door boarding, or even respect a bus lane. What is wrong with us? Why are our public officials so cowardly? What are they afraid of? It cannot possibly be worse than the Texas Dept of Transportation. "Why are our public officials so cowardly? What are they afraid of? It cannot possibly be worse than the Texas Dept of Transportation." So in terms of transit, it might likewise be easi(er) to build an equally "up-to-date" transit line that follows all best practices in a region (Texas) that had little existing transit friction and only knew one thing, traffic congestion: there were no complicated, thoroughly-embedded old light rail lines with vocal constituencies to update, no entrenched labor groups to outmaneuver (save for the bus drivers I suppose), no antiquated maintenance distractions, and so on. Once you outmaneuver the "free market" roadbuilding statists, I'd guess it'd be fairly easy to airlift in a correctly-configured transit system on a "cherry" Sunbelt transit authority. To me it seems that most transit projects are built to the "best practices" of their time, and as is typical in the US, they pretty much aren't updated or modernized after that. So Boston's Green Line may have been state-of-the-art when it was built, but cultural inertia has prevented it from being modernized. Houston's or Salt Lake City's light rail were likewise built to the best practices of their time, but fifty years from now they might also struggle to modernize. Let's also admit that, for all the car-orientation, the Sunbelt still seems to have a "let's build anything and everything!" culture, as reflected particularly in Houston, whereas the Northeast and Midwest have locked themselves into a hysterical stasis in which they can't bring themselves to modernize, replace, improve, infill, densify, or expand ANYTHING, let alone transit!